Types of Chefs: Executive Chef, Sous Chef & Celebrity Chefs – Who’s Who in the Kitchen? The contemporary kitchen, from institutional to fine-dining restaurant, runs according to a strict hierarchy in which the chef plays the lead role. Assignments differ based on the precise needs of a given kitchen, but in most upscale American and European facilities the nomenclature and roles are determined by the Brigade System. Within the brigade system, there are ten primary stations that must be staffed. Smaller establishments will often combine one or more stations together and assign them to a single chef in order to maximize the efficiency of a limited kitchen staff. Larger establishments, on the other hand, may add additional stations in order to further distinguish some of the individual specializations within each larger station. The role of the saucier, commonly known as the sauce chef, is often the highest respected role in the kitchen brigade system of stations, reporting directly to the head chef or sous-chef. The saucier is responsible for a variety of tasks, such as sautéing foods and preparing soups and stews, however, their most vital role lies within the creation of all sauces and gravies that are meant to accompany other dishes. The poissonnier, commonly referred to as the fish chef, is responsible for the preparation of all fish dishes in the kitchen. This can include acquiring fresh fish on a daily basis from local fishermen or other merchants, as well as bringing in non-local catches, as needed, to supplement the menu. The poissonnier is also in charge of preparing all of the fish dishes on the menu, whether they are entrees or appetizers. In smaller kitchens, the poissonnier will often prepare any sauces that need accompany the fish, in the absence of a saucier. This would also make him responsible for any fish stocks or soups as well. The rotisseur, also known as the roast chef, is in charge of preparing any roasted or braised meats on the menu. This includes anything from steaks to veal to lamb or any other similar items. The rotisseur may also be in charge of obtaining meats from local suppliers or arranging deliveries from other retailers. The cooking styles used often focus on cooking the meats very slowly in order to hold in as much flavor as possible. Many meats are also braised, which involves searing the outside of the meat to lock in moisture and then cooking it in the oven or on a stove to bring out the flavor of the meat and obtain a tender cut. The grillardin, also known as the grill chef, is, as the name implies, responsible for any foods that must be grilled. This can include meats, poultry, or even vegetables. The friturier, more commonly known as the fry cook, handles any foods that must be cooked in oils or other animal fats. Like the grillardin, the friturier can handle anything from meats to potatoes to vegetables. The entremetier station is where one would find the vegetable chef. 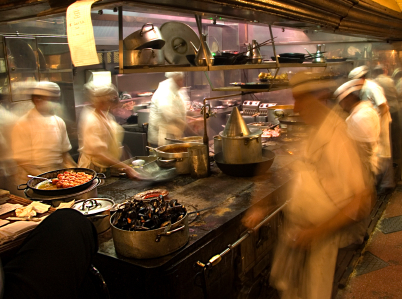 Unlike other stations that are managed by a single chef, larger establishments may often choose to employ two different chefs to work the entremetier station. A potager chef would be in charge of making any soups that are on the menu and a legumier chef would be in charge of preparing any vegetable dishes. The tournant is the all-purpose chef in the kitchen brigade. The role is designed to move from station to station, assisting with any tasks, as needed. The tournant, along with his commis, must have a broad knowledge of the basic operations of each station, allowing him to step in when another station member is absent or the workload approaches a more hectic pace. The garde manger, also known as the pantry chef, is in charge of most cold dishes on the menu. This includes various salads and cold appetizers, such as pate, cheese spreads, or even tartars. The garde manger is also in charge of making any large buffet services look presentable. This is typically done with a variety of decorative vegetables and other food items, particularly when they are carved or molded into unique and artistic designs. Ice carving is a garde manger discipline that sets some specialists apart from their contemporaries. The boucher is in charge of preparing all meats and poultry before they are delivered to their respective stations for preparation in menu dishes. Also commonly referred to as a butcher, the boucher may also handle fish and seafood preparations as well. The patissier, also known as a pastry chef, is typically one of the most beloved of all the station chefs, particularly for the dishes he is charged with preparing. This station is responsible for creating or preparing baked goods, such as breads and pastries. Sweet breads and croissants are the breakfast bounty of pastry chefs, but sophisticated chocolates and petit fors provide elegant proof that this is an artistic discipline. You’re probably not going to run into a lot of French job titles during your quest for employment. The important thing to remember is that fine-dining and casual restaurants have their own requirements when it comes to chefs, and over the past decade the stakes have gone up. Food consciousness is at an all time high, so well trained professionals are in demand. The industry promotes from within, so if you want to advance, don’t get hung up on fancy French monikers. Instead, find your culinary niche and tackle it with passion and enthusiasm. To increase your mobility in the industry it is important to lay a solid technical base for your climb through the ranks. If you’re embarking on a culinary career, it’s important for you to understand the various positions commonly held by professional chefs. A clear view of where you’re going lets you set your sights on your kitchen dream job and never look back. Executive Chef, also known by the term Chef de Cuisine, is the professional pinnacle to which many chefs aspire. Chef’s are kitchen managers so payroll, food-cost, personnel management, menu creation and essentially everything that happens in the kitchen falls within their scope of responsibility. Sous Chef, or Assistant Chef, is the right-hand to the Executive Chef. Sous Chefs manage a staff of assistant chefs, cooks and kitchen workers, as well as creating dishes for the menu. Senior Chef, formally called Chef de Partie, is assigned one particular menu specialty in which he or she excels. Senior Chef directs the prep work of kitchen staff and assistant cooks in his or her area. Demi Chef is very similar to Senior Chef. Customarily this chef would specialize in one type of dish and perhaps direct the prep work of staff key to that specialty. A good example would be sushi chefs. Pastry Chefs are responsible for creating chocolates, breads, and pastries that find their way to the dessert menu. They work in concert with bakers, chocolatiers and others dessert and pastry specialists. Pastry chef colleges focus on training for this delicious job option by offering pastry classes alongside traditional chef’s courses. A chef is trained to master culinary forms, but also to provide creative innovation in menu, preparation and presentation. A cook is trained to master forms of food preparation, but usually takes close direction from a chef. The modern culinary world is exploding with chef job opportunities that are no longer tied to traditional kitchens. The TV food culture points up a trend that elevates chefs to positions of celebrity and power. Brands like Rachel Ray and Guy Fieri could not have been imagined only twenty years ago. Food credibility apparently translates into a general stamp of approval for charismatic personalities who have found fame and fortune through cooking. The general food awakening occurring in the United States has amped up the demand for better than average food. Seemingly insatiable foodies want your kitchen knowledge and cooking abilities too, but in the end a tasty meal is right at their fingertips when YOU make it, so get an education and think outside the box when it comes to where you’ll cook. Private or Personal Chefs make a name for themselves in the pampering kitchens of rich and famous folks. Celebrity chefs like Wolfgang Puck and Emeril Lagasse have opened the door for other charismatic chefs to share their culinary chops on TV. Restaurateurs bring unique culinary points of view to discerning diners in the spirit of owner/operators who enjoy the freedom, control and responsibility of running their own enterprise.